Today we are thrilled to announce our official 1.0 release of Cosette, a SQL solver for automatically checking semantic equivalences of SQL queries. With Cosette, one can easily verify the correctness of SQL rewrite rules, find errors in buggy SQL rewrites, building auto-graders for SQL assignments, developing SQL optimizers, busting “fake SQLs,” etc. What is a SQL solver and what can it do? These two queries will produce the exact same results no matter what the input relations r and s contain, and no matter what the predicate p is. So one can freely use one query for the other for any reason, e.g., improve query execution time, reduce amount of resources consumed, etc. Such rewrites form the basis of query optimization on modern database systems, such as MySQL, PostgreSQL, SQL Server, and [you name it], which all of us interact with (directly or indirectly) every day. One would hope that all rewrites performed by database systems are indeed semantically preserving. Unfortunately, such rewrites are developed and checked by humans, and humans make mistakes. For example, can you decide if the following query Q3 is equivalent to the previous Q1? Thus Q1 and Q3 are not equivalent. If the two SQL queries are equivalent, Cosette will find a mechanical proof for the equivalence and validate it in using a Proof Assistant (currently Coq). If the two SQL queries are inequivalent, Cosette will find a counterexample to show they are not equivalent. 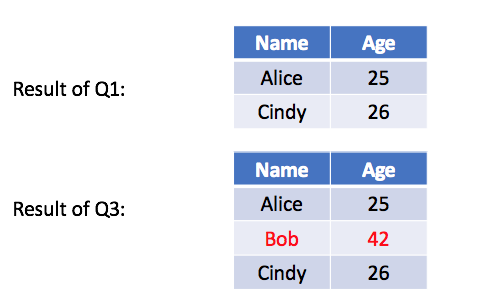 A counterexample is a set of specific input relation(s), where the two SQL queries will produce different results when executed using them, such as the one shown above. There might be very complex cases where Cosette cannot decide the equivalences within time and computation resource limits. In such cases, Cosette will need help from users in order to finish the proof or come up with a counterexample. Cosette proves the semantic equivalences of SQL queries by compiling them to machine checkable mathematical representations (called denotational semantics in programming languages research) and then using simple mathematical principles to reason about them. Let’s take a look at how Cosette compiles the queries above. Notice that (“Alice”, 25) appears twice in the relation. Using the K-Relation representation, r(t1) = r(t2) = 2, and r(t3) = 1. For any other tuple t, we have r(t) = 0.
where t is a tuple. Now here is the cool part: by using the distributivity of * and +, we can prove that Q1 is equivalent to Q2 since we can make them syntactically equivalent! This is how Cosette works internally. In addition, all the proofs are checked by a proof assistant called Coq. A proof assistant is a tool that checks the correctness of a proof mechanically. To learn more about how Coq (or proof assistants in general) works, check out this lengthy proof of the four color theorem, which is basically impossible to be check manually. You may ask, what if two SQL queries are not equivalent? We will never find a proof, right? Indeed. However, since it might take a while (like, forever) for us to conclude that a proof doesn’t exist, it would be easier to show inequivalences by finding a counterexample. In Cosette, a counterexample is a set relations where the two queries will return different results when executed on them. Cosette search for such counterexamples using a SMT solver. The cool thing is, as a user, you don’t need to worry about how solvers work, since Cosette will compile SQL queries to the representations that a SMT solver can understand for you (just like how it compiles queries to K-Relations as shown above). Let’s look at an example. Assume you have two relations, parts with attributes pnum and qoh, and supply with attributes pnum and shipdate. The above two queries were believed to be equivalent and were introduced as a clever rewrite rule in a database system in the 80’s. Three years afterwards, a researcher found that they are actually not equivalent , since Q5 ignores the empty groups. The above shows the counterexample that Cosette found: supply as an empty relation and parts as a relation with only one tuple (pnum:0, qoh:0). You can try this example in our online demo (select “Example: Count Bug” from the dropdown menu) and you will realize how this is indeed a counterexample that shows the falsity of the rewrite rule. Playing with Cosette online demo. Building your own applications using Cosette Web API. Subscribing to Cosette mailing list and following us on Twitter. This post was authored by Shumo Chu, Alvin Cheung, and Dan Suciu. We would like to thank Konstantin Weitz, Chenglong Wang, Daniel Li, and many other members from the database group and the programming languages and software engineering group at the University of Washington for their contributions and help.